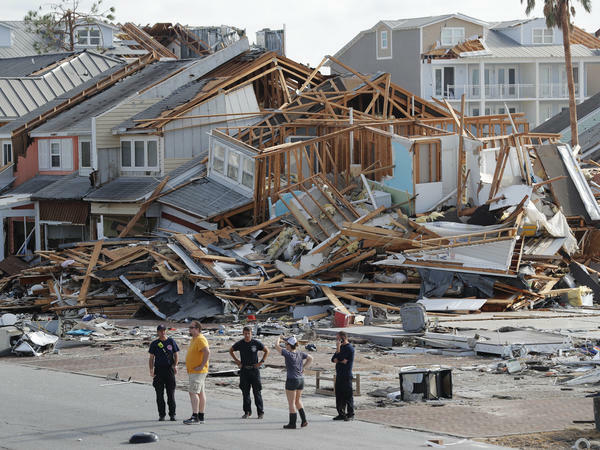 Rescue personnel search for people who may need help in Mexico Beach, Fla., on Thursday, one day after Hurricane Michael made landfall near the area. 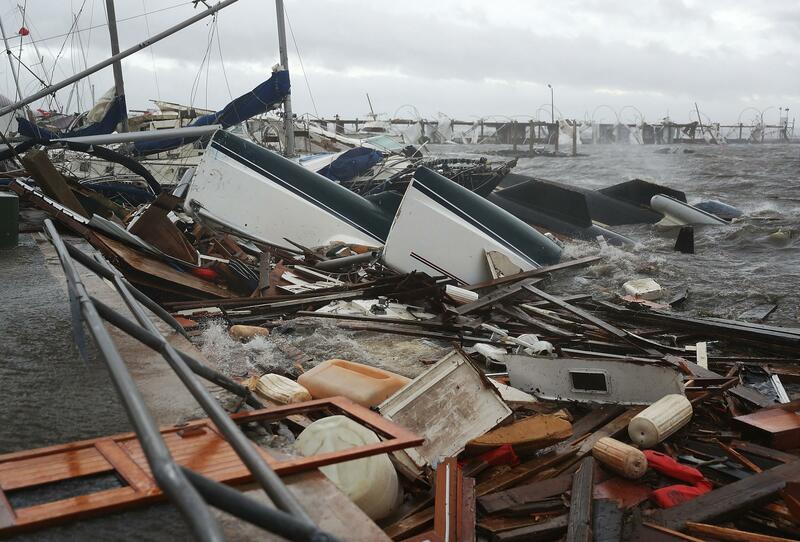 Boats that had been docked before the storm are now piles of rubble. Officials along the coast are urging people not to try to return from evacuation shelters yet. Carol Ralph walks through downed trees blocking her heavily damaged neighborhood just after Hurricane Michael passed through Panama City, Fla., on Wednesday. 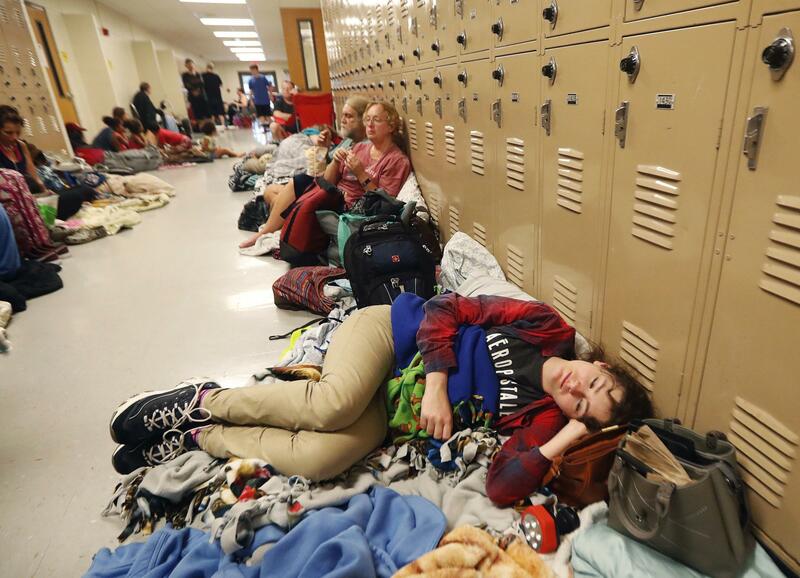 Emily Hindle lies on the floor at an evacuation shelter set up at Rutherford High School, in Panama City. 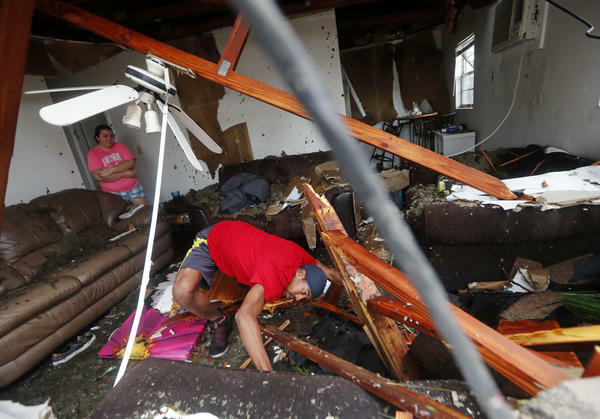 The storm devastated some areas and left others relatively unscathed. Tropical Storm Michael headed from South Carolina into North Carolina on Thursday; both states are still coping with the effects of flooding from Hurricane Florence. 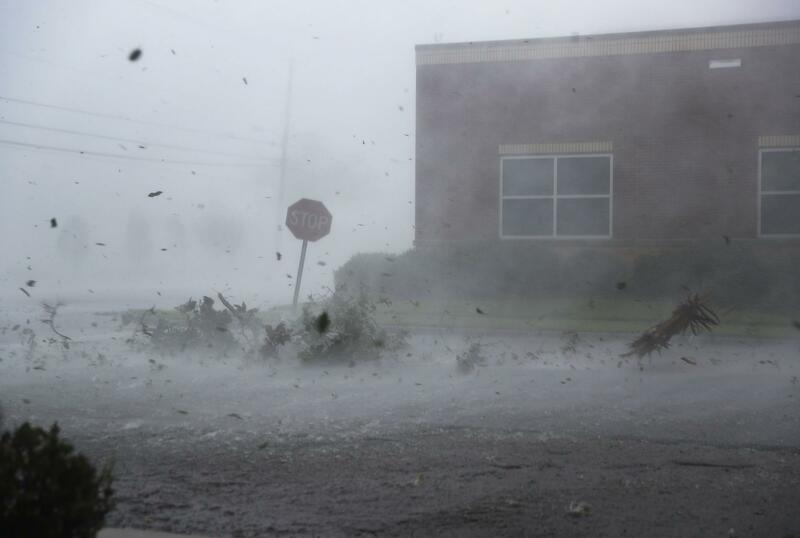 Debris blows down a Panama City street on Wednesday during the storm. The hurricane was one of the most powerful ever to strike the U.S. mainland. Haley Nelson inspects the remnants of her family properties in the Panama City area after Michael made landfall as a Category 4 storm. People check out a damaged store in Panama City. With cell, radio and electrical lines down, the inability to communicate is one of the biggest problems facing authorities. Dorian Carter looks under furniture for a missing cat after several trees fell on their Panama City home during Michael. The eye of Hurricane Michael as seen from the International Space Station on Wednesday. Fallen trees lie on top of a home after Michael damaged parts of Panama City on Wednesday. 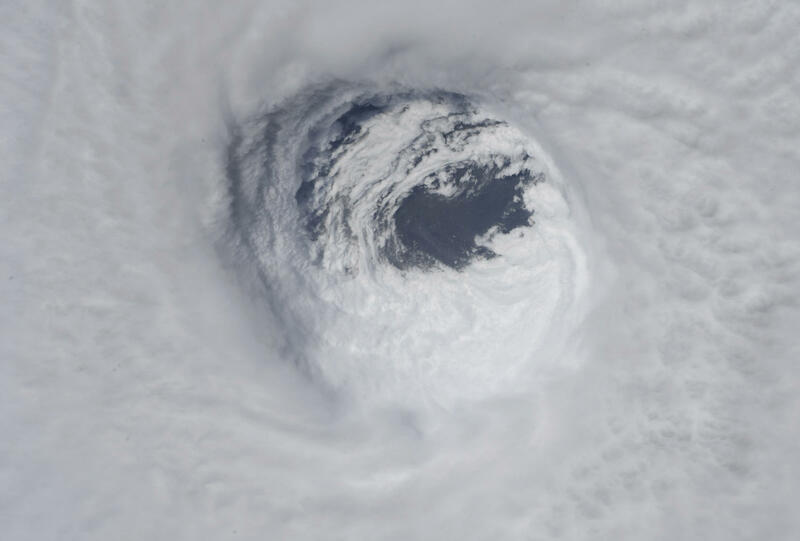 The hurricane surprised many forecasters with its sharp and intense growth. The storm's traveling speed accelerated to 29 mph by evening, according to the National Hurricane Center, with winds of 65 mph. 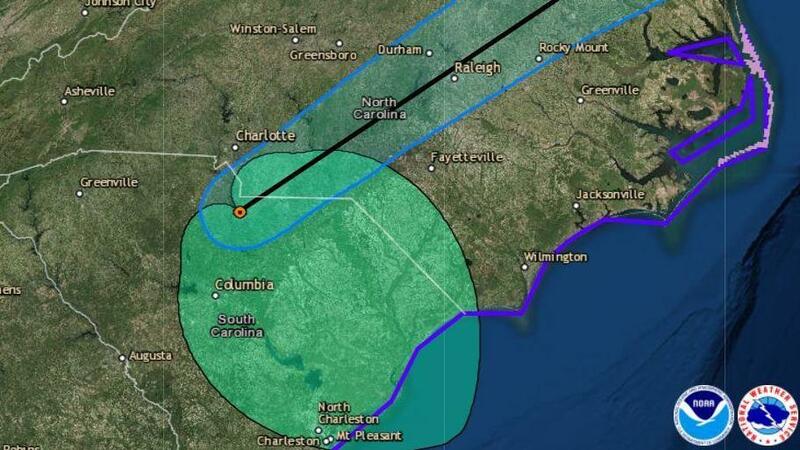 A storm surge watch remained in effect from Ocracoke Inlet, N.C., to Duck, N.C. The hurricane center said life-threatening winds and flash-flooding continued through the evening in parts of North Carolina and the southern mid-Atlantic states. Michael is expected to become post-tropical as it heads across the Atlantic overnight. Nearly 500,000 customers were without power in the Carolinas on Thursday night, along with another nearly 500,000 in Virginia. 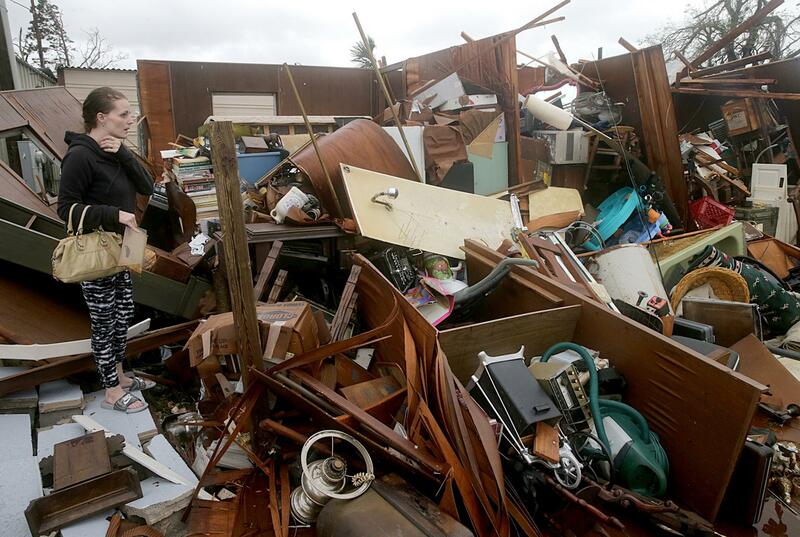 In Florida, search and rescue teams have been working in devastated areas to find people who need help, after Hurricane Michael hit the Panhandle as a historic Category 4 storm on Wednesday. Nearly 400,000 electricity accounts had lost power in Florida as of Thursday evening. 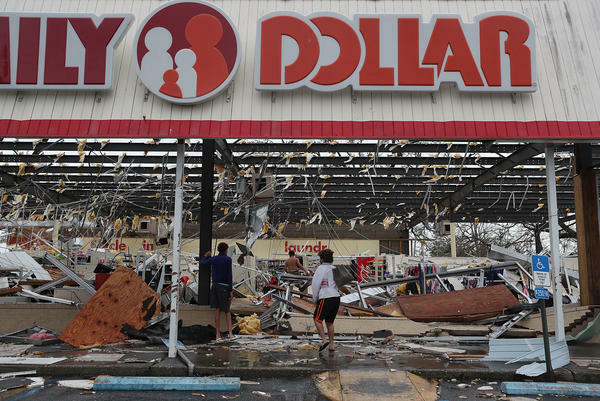 Michael wrecked buildings and tore down trees in Panama City and nearby towns. The city of Tallahassee, known for its extensive tree canopy, says "thousands of trees are down," with widespread damage and blocked roads. The city adds that road crews worked throughout the night "to clear paths to both hospitals" — which are now open and operating. "So many families have lost everything," Florida Gov. Rick Scott said Thursday. "Homes are gone; businesses are gone. Roads and infrastructure along the storm's path have been destroyed." Michael has been blamed for at least seven deaths in Florida, Georgia and North Carolina, according to Reuters. The storm made landfall Wednesday just west of Mexico Beach, a few miles southeast of Panama City. On Thursday, aerial footage of Mexico Beach showed the storm had taken a horrible toll. Dozens of houses on the narrow strip between the beach and Highway 98 were obliterated, wiped off their foundations. Others were missing all or part of their rooftops. Roads were covered with sand and debris. "Everything got destroyed," Bo Patterson, mayor of Port St. Joe, a community of some 4,000 just down the road, told NPR's All Things Considered. He said even his own house, which had never flooded before, was wrecked with the rising water. "Now we've just got a massive, massive cleanup." After making landfall early Wednesday afternoon, Michael tore through the Panhandle and into Georgia, where rains of more than 6.5 inches were reported in some locations. It also brought powerful winds. Georgia Power said on Thursday night that as of 8 p.m. ET, more than 93,000 customers were without power. Michael was still a hurricane when it hit the state. "Georgia's Seminole County Emergency Management Agency said a tree fell onto a home Wednesday evening, killing an 11-year-old girl," Georgia Public Broadcasting reported. "The first death occurred in Gadsden County, Fla., when a man was hit by a falling tree." 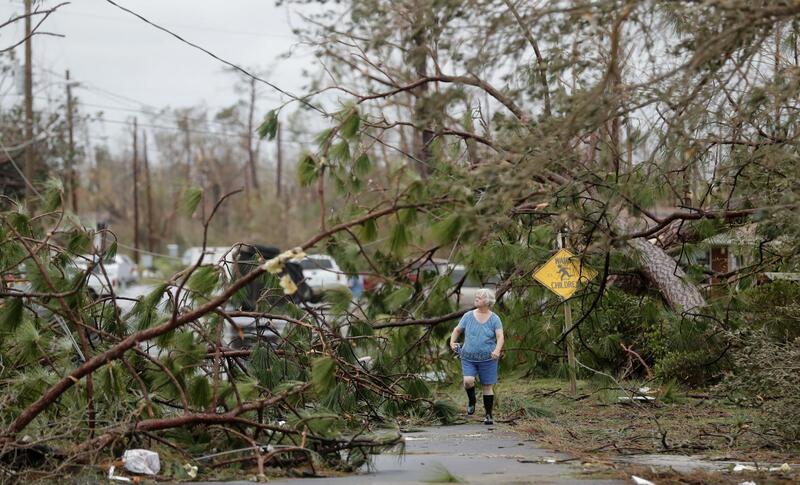 Officials in Florida are still assessing the damage — and urging people to stay off the roads. "The damage to our infrastructure is the most widespread and severe we've ever experienced," Tallahassee's Twitter feed said. "One of our area's most coveted assets, our lush urban forest, was also our greatest vulnerability." The recovery work now follows a pattern that has recently been seen elsewhere in Florida and, last month, in the Carolinas, as crews clear a tangle of trees and other debris from the roads to allow utility workers to come in to reconnect power lines. Officials along the coast are urging people not to try to return from evacuation shelters yet, and they're sharing advice with those who stayed behind. Tallahassee is asking people with water service not to flush toilets if they can avoid it to reduce stress on the system, and the Florida Department of Health says that people who want to use portable generators should plug appliances directly into them, rather than connecting the generator to their home's circuits. "Roads are impassable, covered by water and debris, including downed trees and power lines. 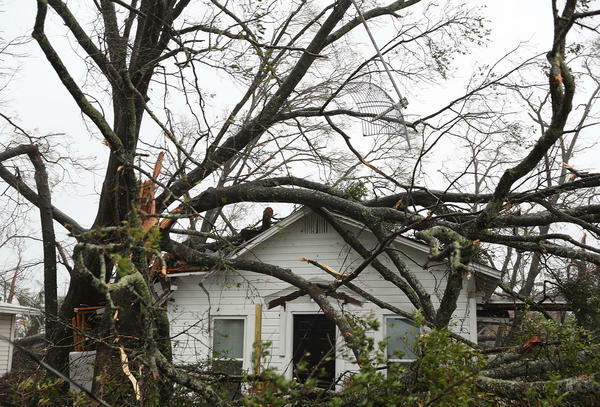 Hurricane Michael's powerful winds ripped roofs from buildings — including a Panama City high school gym where some teachers and their families had taken shelter. "In Bay County, officials have issued a boil water advisory and warn that county communications are hampered." Bay County is also under curfew, as officials hope to prevent looting and unnecessary travel. Early Thursday morning, several Florida counties that escaped the storm began sending work crews and heavy trucks to help clear roads and restore power. As officials tried to get a grip on the situation and shift resources to where they're needed most, one of the biggest problems they faced is an inability to communicate. "We have almost no lines of communication," said the city manager of Panama City Beach, Mario Gisbert, in an interview with NPR. And by that, he said, "I mean, my police chief cannot communicate with my sheriff right now. Cell lines are down; radio towers are down." The effects of hurricanes are notoriously random: One house can be left standing, while a neighboring house might be ripped off its foundation. Gisbert said Panama City Beach — which is several miles west of Panama City — escaped relatively unscathed. "Almost every condo and every hotel is fine" at Panama City Beach, Gisbert said, adding that the town lost many signs and trees. "But as soon as you cross another half-mile to the east, you can see where all the tornado paths were, and it's devastating." Gisbert said the town's police chief told him that "on 23rd Street, which is the main commercial drive through Panama City, they literally ran a bulldozer down the road to clear the debris." Panama City Beach might be able to take in people who need a place to stay or offer other help, he said. Part of the reason he made time to speak to Morning Edition, Gisbert said, was out of the hope that his contacts with the local power company might hear him and get a sense of what was going on. That confusion holds true for residents such as Tanya Robinson, who said she is homeless and living with family now. "The devastation here — it's horrific," she told Elliott, her voice quavering. "I mean, I'm just in so much shock because I've never seen this happen in Panama City before." The situation is no clearer in nearby Mexico Beach, NPR's Greg Allen reported. "It took us nine hours to get here, because you just don't know what roads are open. And where the roads are open, they are just barely," he observed. "And good Samaritans are doing what they can, but it's still a very hard slog to get in or out of this area." President Trump issued a major disaster declaration in Florida on Thursday, ordering federal aid to bolster recovery efforts. The action makes funding "available to affected individuals in the counties of Bay, Franklin, Gulf, Taylor, and Wakulla," for things such as home repair and temporary housing, the White House said. Michael surprised many forecasters with its sharp and intense growth. The first weather advisory about the storm went out on Saturday; days later, it became one of the most powerful hurricanes ever to strike the U.S. mainland. While experts had warned that it would strengthen early in the week, they did not predict 155-mph winds. "Since 1851, our records don't show a Category 4 making landfall in the Florida Panhandle," Graham told NPR's Rachel Martin. National Hurricane Center Director Ken Graham discussed the speed with which this storm arrived. By contrast, Florence, which formed near the Cabo Verde Islands, had been the subject of advisories for more than two weeks before it made landfall. "[When] you have storms that come across the Atlantic, you can see them for five, six, seven days," Graham said. "When they form in the Caribbean, there's just not a lot of real estate. So once they form and they start moving, especially with Michael moving during the life cycle anywhere from 12 to 15 mph, they get here quick."